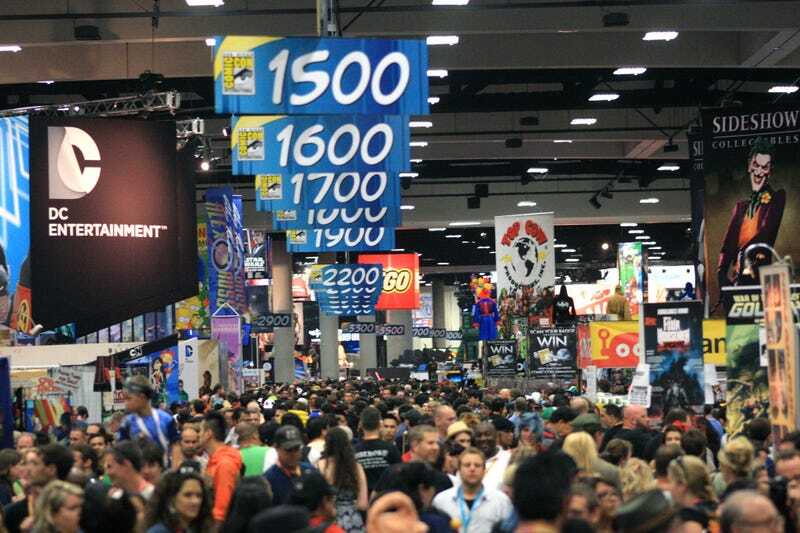 Is San Diego Comic Con still for comics? For years, people have bemoaned the fact that SDCC is increasingly about movies and TV, and now comics retailers are giving up. Yesterday, we listed comics as one of the "losers" of Comic-Con, but veteran journalist and Image Comics staffer David Brothers disagrees. Here's why. Hi, I'm David Brothers, I work at Image Comics, and I had a great time at San Diego Comic-Con this year. From set-up on Tuesday morning to the beginning of tear-down on Sunday evening, I was working at SDCC. When I wasn't at the show, I was in my hotel room trying to keep up with my normal duties at work so I could go out and see friends for a couple hours at night. I was there to work, basically, and I say this to make it plain that I'm not the conventional con-goer. But at the same time, my position as an Image employee gives me a chance to have a unique convention experience and the opportunity to talk to a vast cross-section of con-goers. Our booth was packed throughout the weekend, thanks in no small part to the announcements we made at Image Expo on the first day of the convention and the creators signing comics for their fans. Most people visiting a comics publisher's booth are already on the hook to a certain extent, but I met people who'd been going to SDCC for anywhere between one and twenty-plus years who were all excited to be there. Our booth was packed the whole weekend, and the conversations I had with people were overwhelmingly positive. Overwhelmingly enthusiastic. One of several highlights of my weekend was watching comics creators sign comics for fans. I watched people like Kelly Sue DeConnick, Scott Snyder, Matt Fraction, Chip Zdarsky, Jason Latour, Jason Aaron, John Layman, Rob Guillory, Amy Reeder, and Brandon Montclare go above and beyond every single time. They took photos, gawked at tattoos of their work, and put a smile on the face of everyone they saw. If someone in a costume from one of their books appeared, every creator was on their feet in a shot, ready to take a pic to take home. I was particularly impressed with DeConnick this weekend, who winged her way from one super-packed signing straight to a gathering of the Carol Corps, an informal-but-passionate fan club for the work she's done on Marvel's Captain Marvel series. Trailing behind her on the way to that gathering were even more fans. The gathering was outside, on a set of stairs connected to the con, and fans came out in droves. This picture from the gathering is one of my favorite photos from the con. I defy you to look at this and not feel warm about what comics can and have done. And other comics companies were hopping, too — I know from talking to my friends that Boom! Studios, Vertical Inc., Top Shelf, Viz, and Fantagraphics had a great con. I personally spotted probably a dozen Bee & Puppycat cosplayers. Fantagraphics is one of the best publishers in comics, if not book publishing period, and their beautifully-designed books got a lot of attention. They certainly got me. Archie was situated near our booth and I noticed them killing it, too. I spent some time dealing with creators who were selling their books on their own, too, buying books from people like Kenny Keil and Tom Scioli and Stephanie Lantry. I found Spike Trotman by accident, a superstar webcomics creator if there ever was one, and she was in great humor, pushing her books and blowing minds with her wisdom on the economics of comics. Dumbrella, the webcomics collective, had creators present who were excited to be there. Tabling is hard, definitely one of the hardest jobs in comics, but they did it with inviting smiles. All the people I'm talking about were there as professionals, but the regular con-goers were incredible, too. I spoke to more fans than I did pros over the course of the week, thanks to my time spent on panels. I personally spoke in front of several hundred people over the course of five days. When I played call and response with the audience, they were all into it. The applause in our rooms for the creators speaking passionately about creating comics drowned out the noise of movie trailers and video games. I know people will enter rooms and camp in the back early to see panels that are later in the day, but if our rooms were full of campers, they were the politest and most interested campers in the entire world. I made it a point to ask every room how their con was going, and the reply every single time was a roar. And that's not even mentioning the cosplayers, or the kids, or the people that don't fit the stereotype of a dedicated comics reader, and their eagerness to talk about comics in real life. One cosplayer I met said her week was made by meeting Saga creators Brian K. Vaughan and Fiona Staples during a signing, and then running into Staples elsewhere in the con, being recognized, and having a real conversation. And focusing on Marvel and DC at the expense of the dozens of other publishers in comics, and then declaring comics a failure at San Diego Comic-Con, is incredibly myopic. It's a mistake to think that Marvel and DC are all that mattered, that their new events or announcements dictate the future of capital-c Comics. Marvel and DC are comics, just like the other publishers, and they make some great ones when they let the creators do their own thing. But at this point? You can't treat them like the entirety of the comics industry, or even two companies that can dictate the future of comics. They run the movies, and that's cool, but running comics? It's just not true any more. Image in particular outsells Marvel in the book market as far as trade paperbacks go, and that holds true in the comics market lately, too. That's no coincidence. People enjoy Marvel and DC, but they want more than Marvel and DC. If the announcements from the Big Two felt lackluster, but the fans still had a great time, how did comics fail? That sounds like a Marvel & DC problem. Vertical debuted Moyoco Anno's brand new book In Clothes Called Fat at the show, a comic geared toward adult women. They sold out of Fumi Yoshinaga's What Did You Eat Yesterday?, a romance/cooking comic. At Image, we sold out of Greg Tocchini & Rick Remender's Low, an aquatic sci-fi tale, and Nick Dragotta & team's Howtoons, a comic geared toward getting kids interested in the science through practical play. Boom! burned through Lumberjanes, a comic about girls at camp. These aren't your normal comics, and people were eating them up. Marvel and DC have billion-dollar movie franchises, and that's tough to compete with, at least in terms of making a big splash in the media. But everyone else has Emily Carroll, Simon Hanselmann, Faith Erin Hicks, Hope Larson, Svetlana Chmakova and dozens more. Comics has Raina Telgemeier! Telgemeier has spent years on the New York Times Bestseller list for comics. Years! She's one person, but she's so ferociously talented and her voice speaks to so many people—so many children—that she has managed to beat entire publishers on her own. That's significant. I'll take that, and the enthusiasm that grows out of it, over event announcements any day of the week. As far as I'm concerned, comics had a great convention. Maybe those other folks disappointed, but going by the fans I met, the hands I shook, and the conversations I've had this weekend, comics have never been in a better place and the sky's the limit.